What is Juggling? Juggling is tapping the ball and keeping it in the air with any body part except the hands or arms. It's an individual skill that teaches ball and body control. For soccer players, this means using different part of your body (laces, thigh, chest and head) to maintain control of the ball in the air without using your HANDS!! If you have never tried juggling before please try juggling NOW. Once you get a feel for it, try to do it two or three times in a row without using your hands! Why Juggle? A player's touch is vital in soccer and the reason that juggling can significantly improve your game is it that it helps to develop your touch on the ball. If you can juggle the ball consistently, you are more likely to be able to consistently control the ball in the game. It also shows you are in control of the ball and it is not controlling you. It's a great way for you to learn how the ball reacts to different touches and surfaces. Juggling can also improve your confidence on the ball not to mention, it is fun! When to Juggle? The coolest thing about juggling is that you can do it almost anywhere and all it takes is YOU and YOUR BALL!! Just make sure there are no important breakables around (windows etc). The most effective way to achieving your juggling goals is to PRACTICE ON YOUR OWN! Beating your score and competing against yourself are important keys to improving your game and becoming the best player you can be. 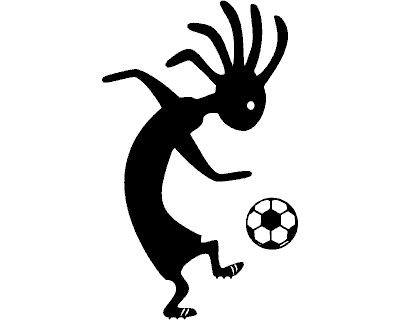 Juggling a soccer ball with feet, thighs or head is an excellent activity for players of all levels. It's not only a good activity for using your spare time but it can also become a very good work out. Juggling Club Procedure: The main guidelines are NO HANDS and NO BOUNCES. Report your score to either Gavin ( ) or Murray ( ) please provide the following information; first and last name, Edge SC team and the number of juggles. There will be a prize for age group winners at the end of the year. From taking your first baby steps to... Entertaining crowds at Montmartre!